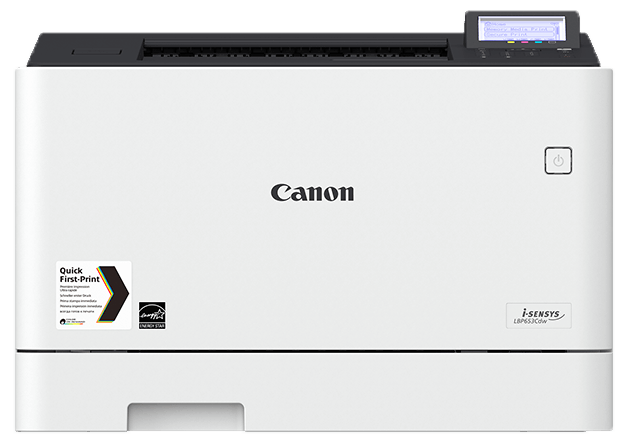 The Canon i-SENSYS LBP-653CDW is a colour laser printer able to print up to A4 size. It is suitable for use in a small or home office, producing high quality, vivid texts and graphics. With easy to change, high-yield cartridges and good paper capacity, printer downtime is kept to a minimum. Wireless connection allows for mobile printing, and a PIN document release system protects sensitive documents, so it is suitable for multi-person use. It is a compact unit, making it easy to place even when space is limited, but as there is no fax, copy or scan function further devices may also be required. The Canon LBP-653CDW measures 437mm x 469mm x 313mm and comes in a grey design suitable for most office decors. Connection is achieved from a USB, network or wirelessly. A multi-purpose tray stores 50 sheets, and a paper tray stores 250 sheets with the option of an additional 550-sheet tray. A five-line LCD screen and a ten-button numeric keypad on the front of the device is used to monitor and manage the printer’s tasks. Print speeds are 27ppm, resolution is 1200 dpi and the monthly duty cycle is 50,000 pages. With generous paper capacity and high-yield cartridges that are easily changed, the downtime needed for maintenance on the Canon i-SENSYS LBP-653CDW is kept to a minimum. Automatic duplex printing helps save on paper. The printer produces high quality, professional results with crisp text and vibrant images. A wireless connection allows for easy printing from multiple devices, including smart devices and remote monitoring, which improves efficiency. The printer uses a PIN document release system to protect sensitive information. The Canon iSENSYS LBP-653CDW is a colour printer only. With no fax, copier or scan function, additional devices may be needed, requiring more space and expense.